All our courses are approved and accredited by the appropriate professional council. Our professionally approved courses are essential to allow students to register as a healthcare professional within their chosen career upon successful graduation. The Nursing and Midwifery Council (NMC) regulates nurses and midwives in England, Wales, Scotland, Northern Ireland and the Islands to protect the health of the general public. The Health and Care Professions Council. They protect the public by regulating health, psychological and social professionals through setting the standards for their training, professional skills, behaviour and health. 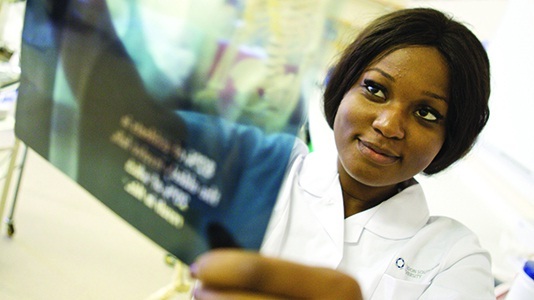 The Society and College of Radiographers is the only professional body in the representing the whole of the radiographic workforce. They are a trade union and professional body representing the professional, educational, public and workplace interests of its members. The College of Occupational Therapists is the professional association for staff in Occupational Therapy. The College sets the professional and educational standards for the occupational therapy profession and represents the profession at national and international levels. The British Acupuncture Accreditation Board (BAAB) is the accrediting board for degree level courses in acupuncture. The BAAB fosters and monitors high quality educational standards to assure the general public that all new graduates from BAAB-accredited acupuncture programmes are knowledgeable, reflective, competent and safe practitioners. The General Chiropractic Council is an independent statutory body that regulates chiropractors in the UK to ensure the safety of patients undergoing chiropractic treatment. The Chartered Society of Physiotherapy is the professional, education and trade union body for UK's 57,000 chartered physiotherapists, physiotherapy students and support workers. A member of UNISON, the CODP offers advice and guidance on professional issues for all those working in the field of operating department practice.